As an undergraduate student at the University of Iowa, Stephen Paulk, MD (69BS, 73MD, 78R), tutored student-athletes in multiple science courses. While his work was instrumental in helping Hawkeyes thrive in the classroom, Dr. Paulk’s part-time tutoring position also played a vital role in his success at Iowa and beyond. “Working as a tutor gave me some financial assistance when I needed it most,” says Dr. Paulk, a native of Harlan, Iowa, who started off as a dental student before pursuing a medical degree. 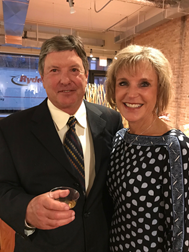 After completing his general surgery residency in 1978, Dr. Paulk went on to an auspicious medical career that has now spanned 40 years and two Midwestern states. Dr. Paulk and his wife, Amy, live in Portage, Wisconsin, and have six children and nine grandchildren. Throughout his time as a general surgeon, Dr. Paulk has always looked back fondly on his Iowa experience and continues to be grateful for the quality education he received. For more than 40 years, the Paulks have showed their love for the UI by attending numerous Hawkeye football games and by giving back to support Iowa’s student-athletes. More recently, the Paulks finalized plans to support football, golf, and track and field scholarships in a unique way by gifting a remainder interest in a portion of their Iowa farmland. By creating a retained life estate, the Paulks were able to transfer ownership of one of their farms—located in Shelby County, Iowa—to the UI but retain lifetime use. It’s a win-win for the Paulks. They not only receive an income tax deduction, but they retain control over the farm as long as either one is still living. Had the Paulks simply left the farm to the UI in their will, they would not have benefitted from a significant income tax deduction. For the Paulks, it’s their way of helping Hawkeye student-athletes Fight for Iowa.